Hidden away for long millennia and accessible only to a few chosen ones, the oldest text of Tibetan origin uncovers what awaits humanity in The Book of Secret Wisdom. 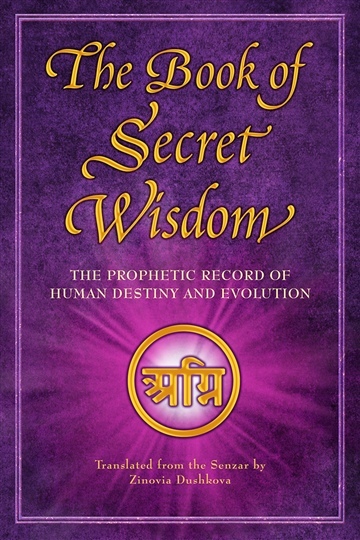 The Book of Secret Wisdom includes a newly released excerpt from the million-year-old manuscript widely known as the Book of Dzyan. The book was originally written in Senzar, a Sanskrit-like language, and was translated by Dr. Zinovia Dushkova in 1995. Far back in the 19th century, the Great Masters of Wisdom permitted Madame Blavatsky, the world-renowned figure of esoteric philosophy, to study the most ancient manuscripts secretly stored in Tibet. Her highly influential works based on those sacred texts have received praise from numerous prominent individuals including Mahatma Gandhi, Albert Einstein, Thomas Edison, His Holiness the 14th Dalai Lama, and even Elvis Presley. In 1889 Helena Blavatsky stated: “During the last quarter of every hundred years an attempt is made by those ‘Masters,’ of whom I have spoken, to help on the spiritual progress of humanity in a marked and definite way.” Blavatsky, who has made accurate predictions in advance of many scientific discoveries, was correct once again. A century later in 1995, the Masters of Wisdom allowed Dr. Zinovia Dushkova to translate twelve new stanzas from the mysterious Book of Dzyan. However, unlike the nineteen stanzas of Dzyan published in Blavatsky’s masterwork, The Secret Doctrine, the new excerpt is translated in simple and understandable language accessible to all readers interested in new age spirituality and conscious living. • What is behind the processes currently affecting our planet, which manifest daily in anomalous weather, global warming, and natural disasters around the world? • Why does it seem that more and more evil is appearing every day, manifesting itself through growing conflicts all over the world? • What really happened in 1999 and 2012? • What is the Great Event expected to occur in 2017, and how does it depend upon the collective will of humanity? • What awaits humanity in the immediate future? • Why does it seem that time is speeding up? • What is the famous Philosopher’s Stone? • Why people are dying, and is there a chance to be immortal? • When will Armageddon happen? • What is the mission of our planet and of every being in the Universe? spiritual and physical evolution of Man here on Earth. . . . The prominent concept here is to awaken humanity to the unmistakable, undeniable fact that it is our destiny to become beings that are able to love and to know what Love is.